Saturday August 21st 1971: Gil Hodges fourth place Mets (61-62) sent Tom Seaver (13-8) to the mound, trying to get the club to the .500 mark. Today they hosted Preston Gomez, last place San Diego Padres (47-80) who sent Dave Roberts (11-12) up against Seaver in front of 26,584 fans at Shea Stadium. It was a typical Tom Seaver low scoring pitchers duel as Dave Roberts matched Seaver along the way. Roberts would allow just two hits & one run going into the 9th inning, striking out seven. 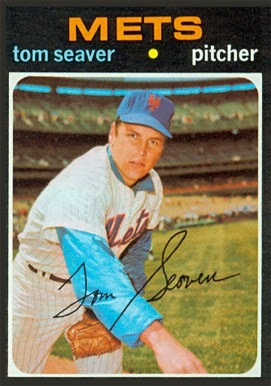 Seaver had scattered six hits striking out eight giving up just one run. In the top of the 5th inning, Ed Spiezio hit a solo HR, his seventh of the season. Spiezo (father of former big leaguer Scott Spiezio) would hit 39 career HRs in 1544 at bats. In the bottom of the 7th, Cleon Jones led off with a triple. Tommie Agee brought him in with a sac fly tying up the game at one. The score stayed that way going into the bottom of the 9th. In the 9th, Larry Stahl walked & stole second with one out, but Seaver got "Downtown" Ollie Brown to line out & Spiezio to fly out to right ending the threat. In the bottom frame, Ted Martinez grounded out & Ken Boswell flew out. Cleon Jones stepped in & was the hero of the day, hitting a walk off HR to end the game, giving Seaver his 14th win of the year. 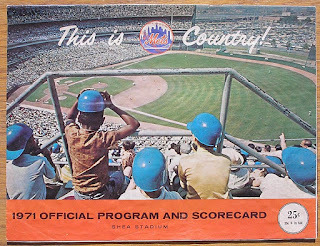 A week later on Saturday August 28th 1971: The Mets (65-64) had barely gone over the .500 mark. Gil Hodges Mets hosted Walter Alston's second place Los Angeles Dodgers (69-63). The Mets had already defeated L.A. in the first game of this Saturday afternoon twin bill at Shea Stadium. In the night cap, the starters were Gary Gentry for New York & the Dodgers Don Sutton. Sutton was outstanding on the day, shutting out the Mets through seven innings, allowing just three hits, striking out six. Gentry was also tough, as held the Dodgers scoreless until the the 8th inning. Duke Sims doubled to right field, and a young Bobby Valentine was brought in to pinch run. Next pinch hitter Tom Haller lined a base hit to right, scoring Valentine. In the 8th Jim Brewer relived Sutton, he retired the first two batters but then catcher; Duffy Dyer doubled to center. Tommie Agee then singled to left field tying up the game 1-1. Tug McGraw came in & pitched a scoreless 9th inning. In the bottom of the 9th, with two outs, Cleon Jones stepped in & was the hero once again. 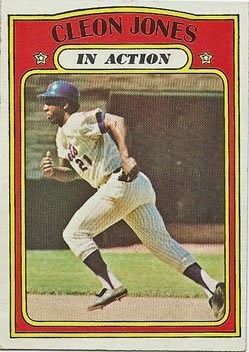 Cleon hit another walk off game winning HR, thrilling the crowd of 43,492 with a 2-1 Mets win. McGraw earned the victory bringing him to 9-5 on the year, while holding a 1.83 ERA.